Debut solo DVD from Yes singer! 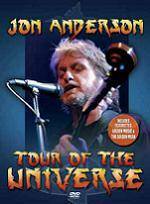 More information: “Tour of the Universe” is the debut solo DVD from Jon Anderson - a musical passage through life, time and the world beyond, featuring many new songs as well as classic hits from his work with YES and collaborations with VANGELIS. Recorded live at XM Satellite Radio in Washington, DC, Jon’s inimitable performance has been crafted with dramatic animation and innovative visuals to create this pioneering concept DVD. Golden Music: Concert pianist Roy Howatt of Cambridge University explains how the Golden Mean has influenced the works of the great classical composers Béla Bartók and Claude Debussy. The Golden Mean: The Golden Mean is a source of fascination for Jon Anderson; Dr. Ron Knott reveals its mysteries and explains how its imprint can be found all around us.